While visiting the highland village of Kritsa, we decide to explore the fortress city of Lato, just a few kilometers away. 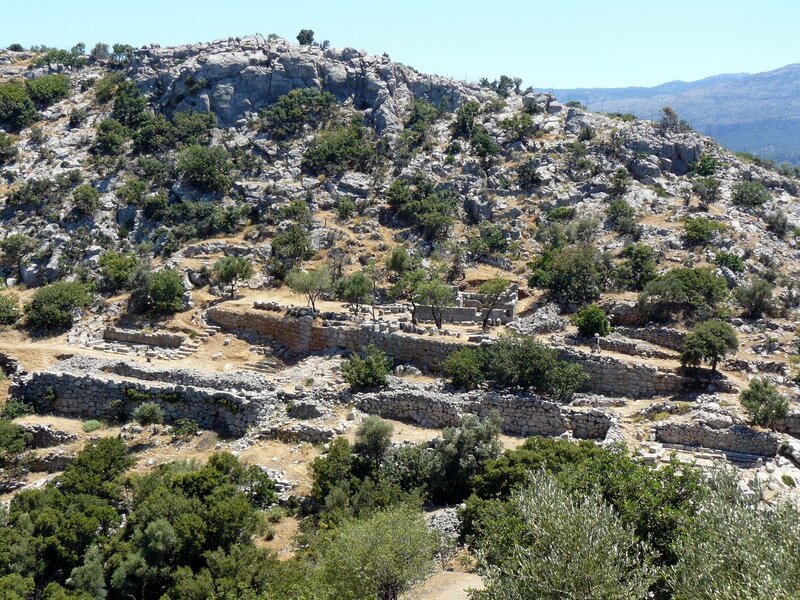 In the late 19th century, a famous archaeologist examined its “cyclopean” walls (built with huge stones that only a giant Cyclops could have lifted) and declared Lato a Mycenaean city. That misguided assertion was more than a thousand years off the mark. 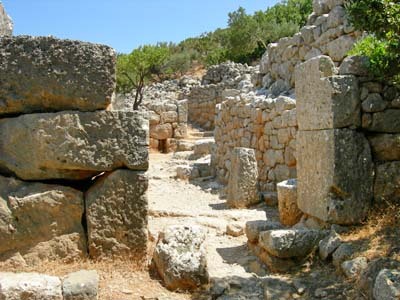 The city was founded by Dorians in the 7th century BCE, during what is known as the Archaic Period. Immigrants from the mountainous region of northern Greece, Dorians were a warlike people who preferred to build their towns in hard-to-assail locations. 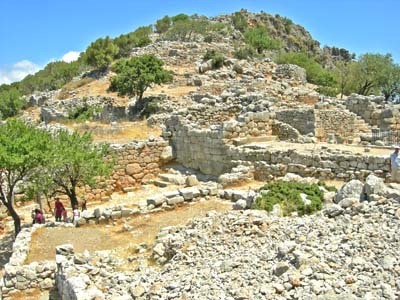 They found an ideal place on two naturally fortified hills overlooking a seaport the Dorians had established at Kamara. 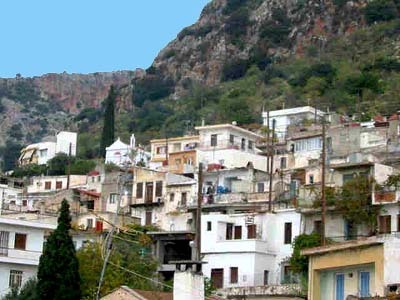 The city was named Lato, which is the Dorian pronunciation of Leto – the mythical mother of Apollo and Artemis. It prospered and grew into one of most powerful cities of Classical-Hellenistic Crete, controlling a large territory [see map]. We hike up the ancient road to the main entrance gate, which is a rather small opening in the mighty fortification wall surrounding the city [see site map]. In ancient times, the gateway was actually a rectangular building closed by three strong doors. 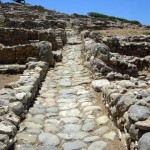 It forced attackers to break through repeated barriers in a narrow passage controlled by fierce warriors . . . an almost impossible task. 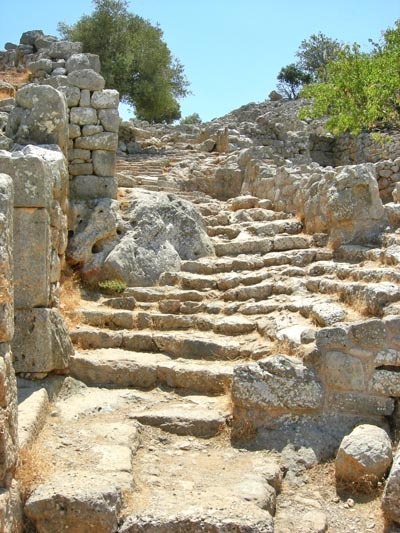 If invaders survived this trap, they would still have to climb a long stairway that passes through a number of terraces before reaching the city center. 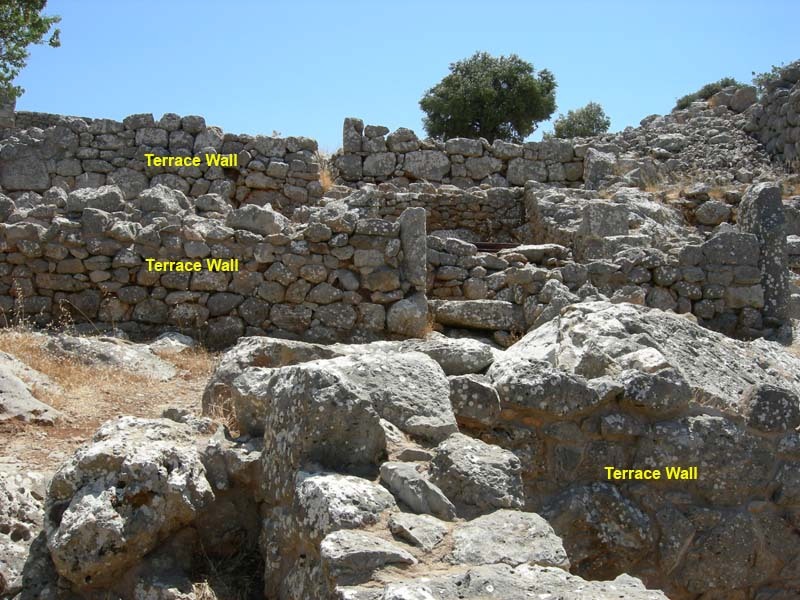 Each terrace adds another strong wall with a portal that could be blocked off, creating a series of defensible positions all the way to the top of the hill. No rational commander would order his army to certain destruction in such a gauntlet. On the left side (north) of the road are stone-walled homes and a couple of defense towers, and on the right are the shops and workshops of craftsmen. 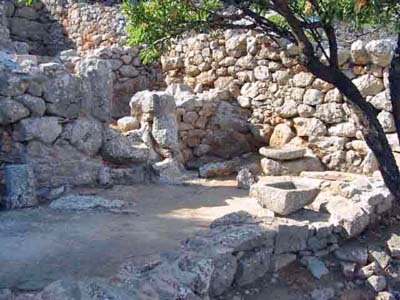 One of these is believed to have been the workshop of a textile dyer, because of the mortar and stone vessels found there. At the top of the stairway we enter Lato’s central market square, or agora, which lies in a shallow valley between two peaks. Directly before us are the remains of a large stoa (a covered walkway or portico), which was probably used for market, cultural and political activities. 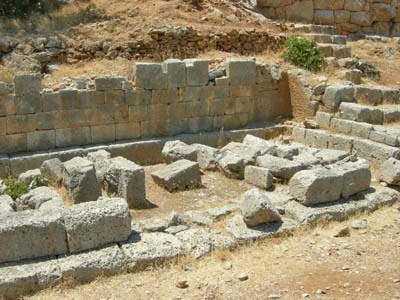 Around the stoa are other public structures, including a shrine, an unroofed building (exedra) with public seating, and a deep cistern that provided water for the community. Just north of the agora is an impressive staircase – flanked by the remnants of towers – leading up to the prytaneion (government house), where the ruling council (kosmoi) met to deal with political, military and judicial matters. 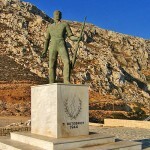 Lato had a ruling council of ten individuals who led the city. In addition to running the judicial system and military, they repaired buildings, built temples, and met with officials from other cities. The council members were elected annually from among four tribes or clans that made up the city population. 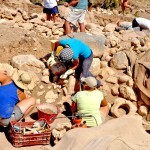 Three Dorian clans and – surprisingly – one Minoan clan were represented. A committee of elders advised the council, and a citizens’ assembly voted on council proposals. It was a very democratic system. 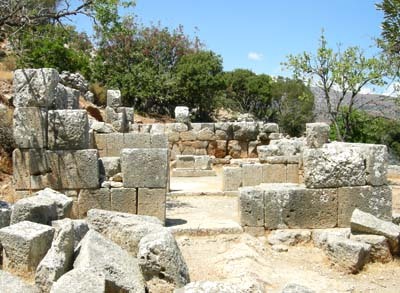 Behind the prytaneion is a complex of houses where members of the ruling council lived during their term in office. There are other houses in the neighborhood around these government buildings, but these are only partially excavated. 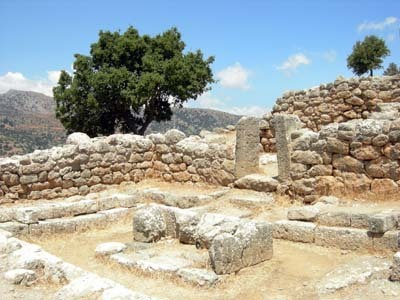 South of the agora, on a terraced hillside, are the remains of a large temple dating from the late 4th to early 3rd century BCE, and a house (perhaps where the temple priestesses lived). 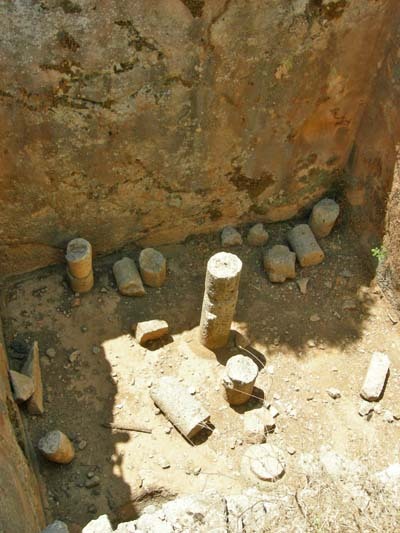 We walk through the temple vestibule into the inner sanctum (cella), where we find the base for a cult statue – probably of Eileithya, the city’s patron deity. 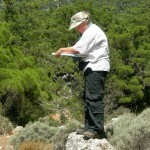 Interestingly, Eileithya was a Minoan goddess long before she was added to the Greek pantheon of deities. 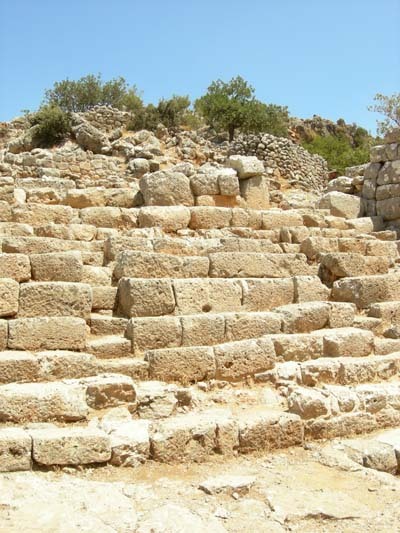 East of the temple, on a lower level, is a small theater space formed by a narrow terrace used as a stage and stone steps that seated 350 spectators. Next to the “bleacher” seats is an open building with stone benches around its three walls. These were obviously the good seats used by the city leaders when attending religious festivals or civic assemblies. Walking back to the agora and down the stairs towards the city gate, we pause at Terrace IV to explore several houses. All of these homes are built with heavy boulders and have narrow entrances to prevent a large group of invaders from breaking down the front door. But this never happened. Lato had problems with neighbors – Olous (now Elounda) to the North, Lyttos to the West and powerful Ierapytna (now Ierapetra) to the South – usually when Lato threatened their interests or attempted to expand its borders [see map]. These conflicts did not escalate into general warfare. Lato became a part of a league of Cretan states during the 3rd century BCE, and during the 1st century became a vassal of the Roman Empire. There never was an attack on the great fortress of Lato. The Latoans eventually grew tired of living in an invincible mountain stronghold that was never threatened by anyone, so they decided to move closer to the sea. They abandoned the old city and moved to their seaport at Kamara, which is where of their business (and some say piracy) interests lay. What became of Kamara? 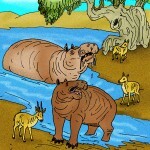 There were many hardships, wars and different rulers over the centuries. 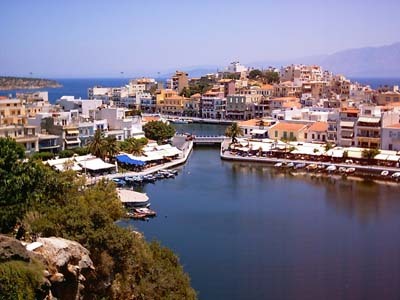 Now it is called Ayios Nikolaos, a port city, tourist haven, and capital of the Lasithi prefecture.